My family’s journey into natural living actually began when I was a child. My mother was passionate about green living and saving the environment. I learned from my parents how to recycle, garden, live simply and make healthy choices. I grew up in the 80s and 90s and we didn’t have much information available to us about natural living, so most of what we did was common sense. Unfortunately, my parents didn’t realize that using conventional personal care products wasn’t exactly green or natural. We had no idea what was in our personal care products and at the time there weren’t any natural alternatives to the popular brands of the day. When I became a mom, my love for green, natural living persisted. Fortunately, I became a parent at the same time that the green movement was growing rapidly. One of the first companies I ever purchased natural personal care products from was Tom’s of Maine. Because Tom’s of Maine was there when I was struggling to find personal care products like deodorant and toothpaste for my family, they’ve always been at the top of my list of preferred natural/green companies. That’s why I’m so happy for the opportunity to share with you some of my favorite Tom’s of Maine personal care products. As you know, I have three sons. Do I need to tell you what my car can smell like after an evening of soccer practice? Well, let’s just say, it only takes one kiddo to forget his deodorant and the whole vehicle reeks. That’s why I buy my boys Tom’s of Maine Wicked Cool!™ Deodorant. They love that there’s a deodorant made just for them and I love that there are no artificial dyes or fragrances in it. The scent is great and keeps my car from smelling like I’m transporting wild animals. Tom’s of Maine Wicked Cool!™ provides 24-hour odor protection and is free of aluminum, parabens, and artificial fragrances. It fits perfectly into our natural lifestyle. I’m fortunate to have married a guy who believes that natural, green living is a good thing and not some chore that his wife makes him do. He’s always looking for new natural living products to try. That’s why I was excited when I saw that Tom’s of Maine had an antiperspirant just for men. 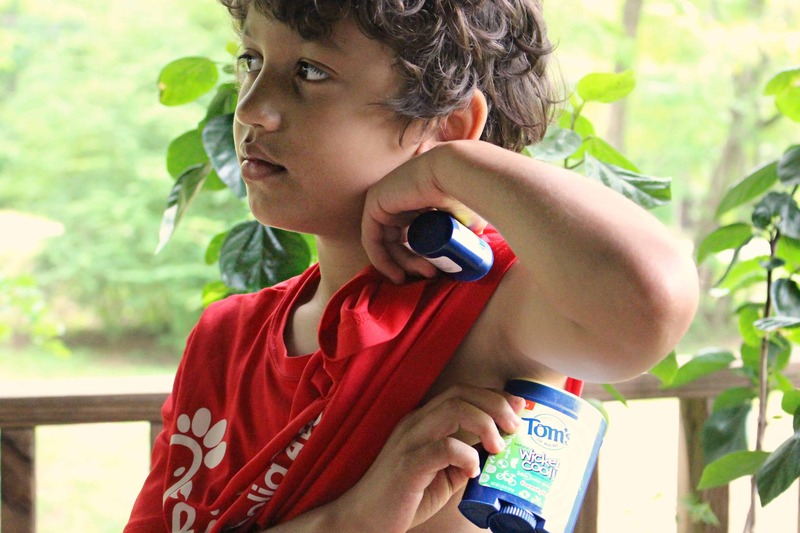 The Tom’s of Maine Men’s Naturally Dry Antiperspirant™ comes in a lovely North Wood scent that’s not overpowering. It provides my hubby with all day odor and wetness protection without petrochemicals, artificial fragrances, or irritation. One of the Tom’s of Maine personal care products I’ve most recently tried is the Luminous White™ Toothpaste. It is an advanced natural whitening toothpaste that is safe for enamel, and gluten and paraben free. The Clean Mint flavor leaves my mouth feeling fresh and clean. One of the best things about the Tom’s of Maine personal care products that my family uses is that they are part of Target’s Made to Matter program. You can only get these products at Target where they were handpicked for the Made to Matter program. You can find each of these products in your local Target’s personal care aisles. If you’re ready to start living a greener, more natural lifestyle, changing your personal care products from conventional brands to natural brands like Tom’s of Maine is a great place to start. It’s a simple change that’s easily attainable and is a good step toward a more natural way of living.